BEN and Gerry aren’t the American hippies who make and sell ice cream but guys who love their Pinot and lashings of pork and duck (and love trying to bait me into an argument by ranting on sensitive political and cultural subjects with extreme views that would make Attila the Hun shudder). These two roustabouts are blokes that I catch up with on an ad-hoc basis at the Emperor’s Garden BBQ & Noodles Restaurant in Sydney’s Chinatown to do some serious damage to a pig and a duck and our arteries. They’re hungry guys and tonight they don’t give a damn about their cholesterol levels. 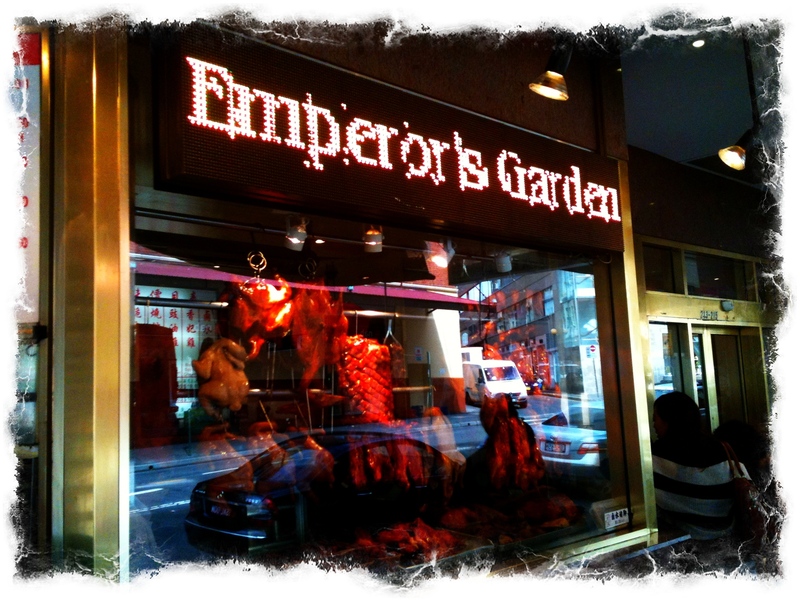 Emperor’s Garden is in Sydney’s Chinatown and is a serious rival to Sydney’s popular BBQ King and, in my opinion, pips it past the post by a good nose. It’s packed mainly with members of Sydney’s Chinese community as well as those in the know. Outside is a small street servery with a feature window where ducks and pork hang. Customers line up to take home a roast duck, suckling pig, soya chicken or roast pork (or small servings of these delights with rice as a take home meal). Inside, tables large and small are scattered around the space – all covered with industrial strength cotton tablecloths to soak up the predictable spillages that come with shared eating. It’s a stark room with specials strategically advertised on the surrounding walls. It’s nothing flash (but a lot flasher than it was some years ago). Staff are attentive and most of all tolerate groups and blokes like Gerry. In the 10 years that I have been dining here, and despite its plain decor, I have seen the likes of Hollywood reporter John Michael Howson and Ros Packer (wife of the late billionaire Kerry Packer), digging into roast pork and Peking duck. The place has also been given some good raps over the years. 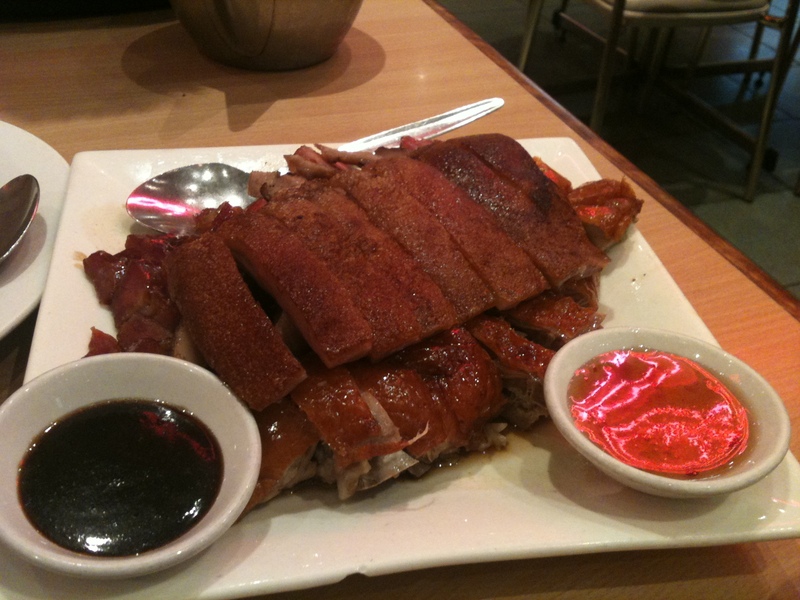 In 1998 food author and critic Terry Durack declared it as having Sydney’s best suckling pork before he headed off to London to write on food for The Independent and only last year upon his return to Sydney he recommended Emperor’s Garden’s soya chicken as one of Sydney’s top 50 dishes. Tonight we go for the tried and tested and succulent – duck, pork, ribs and salt & pepper squid. Alas we are informed there is no suckling pork – it’s all been sold (and it isn’t even 7.30pm), so instead of half a duck tonight it’s a full bird. For starters it’s the usual gow gee – those wonderful translucent steamed dumplings with prawn, and the small, bite-sized pork dim sum (both dishes are four for $8) – to line the stomach for the main event which will soon be delivered on a stainless-steel trolley to our table. Wheeled out is the glistening crimson duck on full display in all its glory (it is to be two courses for $56 – 12 pancakes and six san chow bau). We watch our waiter remove its crispy skin with surgical precision for the duck pancakes. The meaty carcass is then wheeled back into the kitchen to be diced for our san chow bau. The skin is perfectly crunchy but with a moist layer of duck fat residue. The pancake is thin and folded into a square containing the duck skin, tian mian jian (sweet bean sauce), and spring onion. Our Adelaide Hills pinot is the perfect accompaniment to help wash away the tasty duck fat before it overwhelms our palate. 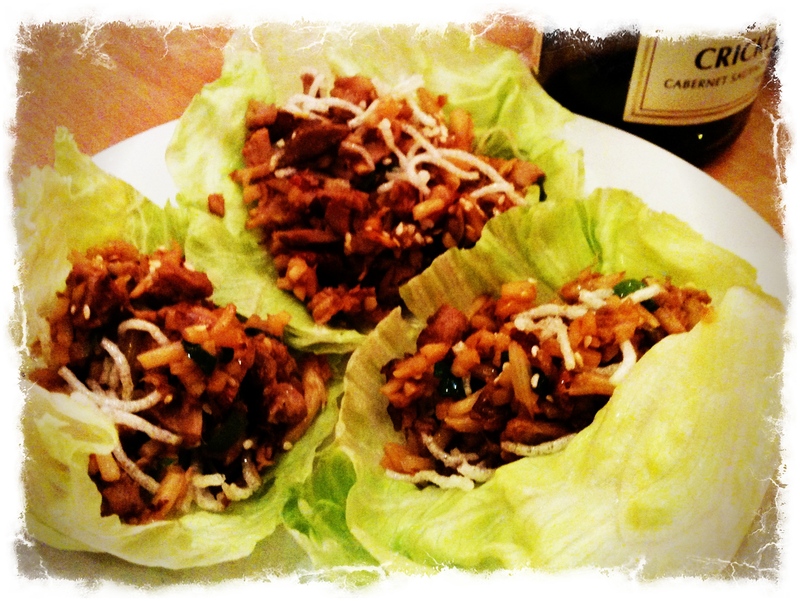 The san chow bao is the perfect “palate cleanser” – crisp lettuce leaf cups stuffed with moist diced duck meat with chopped straw mushrooms, bamboo and crispy fried cellophane noodles. For some the above would be dinner, but not for us. Because our staple combination pork platter (which usually comes with roast pork and suckling pig), can’t be had tonight we opt for a plate of barbecue pork ($16). 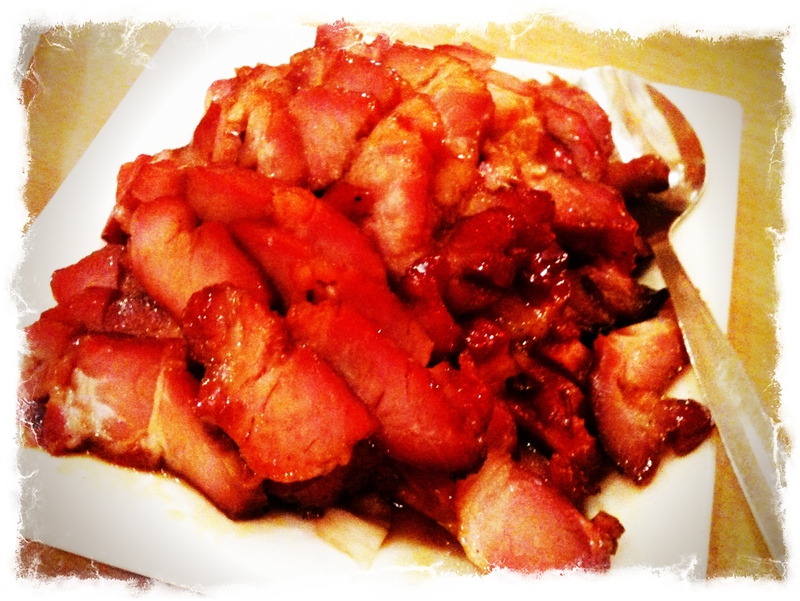 It’s a plate full of sliced deep-pink char siu pork. The tender pieces are moist and impregnated with a seasoning of five spices and has a sticky glaze that adds a balanced sweetness to its roasted and charred outer layer. The veal ribs with black pepper sauce ($21) – to use a cliché – simply melt in the mouth. The meat is milky and firm with peppery flavours popping at the back of the mouth. Our last dish is the deep-fried calamari with salt and pepper ($20) which is a plate of golden and crisp pieces of calamari which have then been tossed in the wok with chopped spring onion, garlic and chopped red chilli. Just looking at it you know it has had a lot of attention to ensure it is not oily and ‘stodgy’. 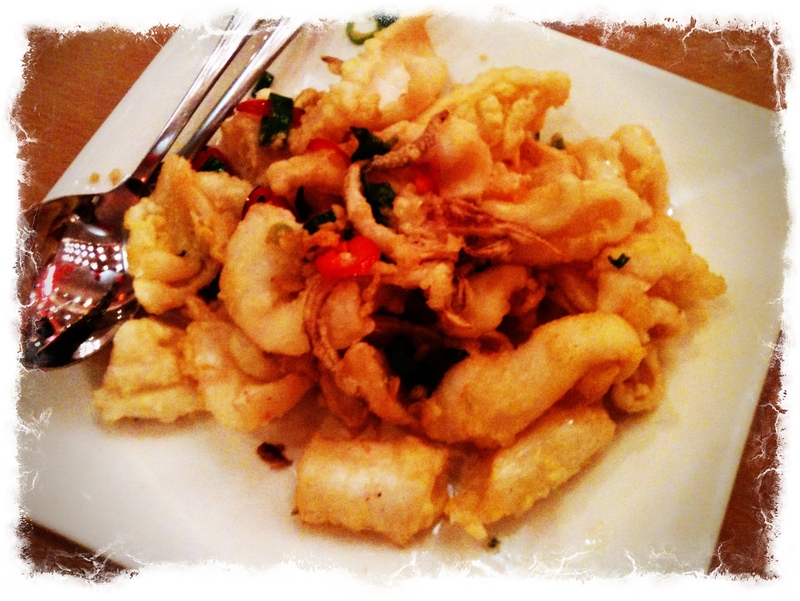 The calamari has a salty and crunchy crust and is tender. The spring onion and chilli combine to pack a slightly powerful and salty punch but don’t detract from the sweetness of the squid. Our arteries would have rebelled if we finished the meal with the old Chinese dessert standby fried ice-cream (which is good here), so instead we went across the road for a schooner of Reches. Update 13 August 2011: Another decent meal at Emperor’s Garden with Corey from Adelaide. This time the feature was the combination roast plate – a choice of three meats (we chose the suckling pig, barbecued pork and roast duck) for $43. It was sublime – the suckling pig with its perfect crisp crackling and moist underbelly the highlight. Corey believed that he could never eat at his favourite Adelaide Chinese roast restaurant again after the experience as nothing would come close as Emperor’s Garden. 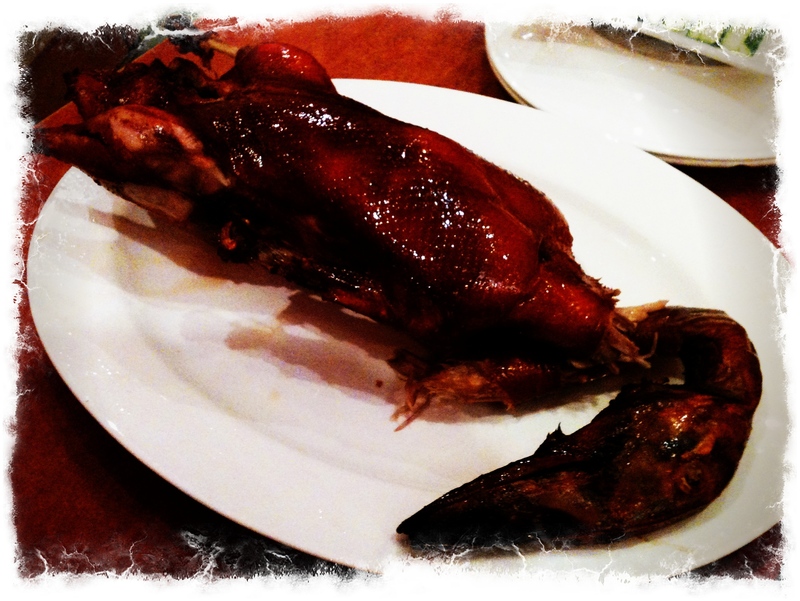 The verdict: One of the best and cheapest Peking duck courses you can get in Sydney. Add to that perfectly cooked roast pork dishes and a comprehensive menu with plenty of choices for those who don’t want to send their cholesterol level skywards and you have a restaurant where even the famous and rich are happy to mix with the ordinary. What: Emperor’s Garden BBQ & Noodles Restaurant, 213-215 Thomas Street, Haymarket, NSW, Australia. Phone (02) 9281 9899. Note: There is a sister restaurant a minute’s walk away in Dixon street but it doesn’t specialise in roasts and BBQ. Ate there: 17 February 2011 and 13 August 2011. This entry was posted in Chinese, New South Wales, Sydney and tagged Australia, Chinese, Food, Sydney. Bookmark the permalink. … this is a pretty decent review of one of Sydney’s best restaurants. This place is right near my new house! Thanks for the heads-up! Except now that i’ve read your review whist balancing my laptop on one knee and dinner on the other….. I am no longer looking forward to eating my sub-standard bowl of cous cous. Yes, it’s true – the best Chinese BBQ ever. Put’s my old favourite, Adelaide’s BBQ City, to shame (although it is twice the price). I guess my quest to find good Chinese BBQ in Adelaide continues….hmmm, perhaps the Emperor’s Garden can open a sister restaurant in Adelaide.